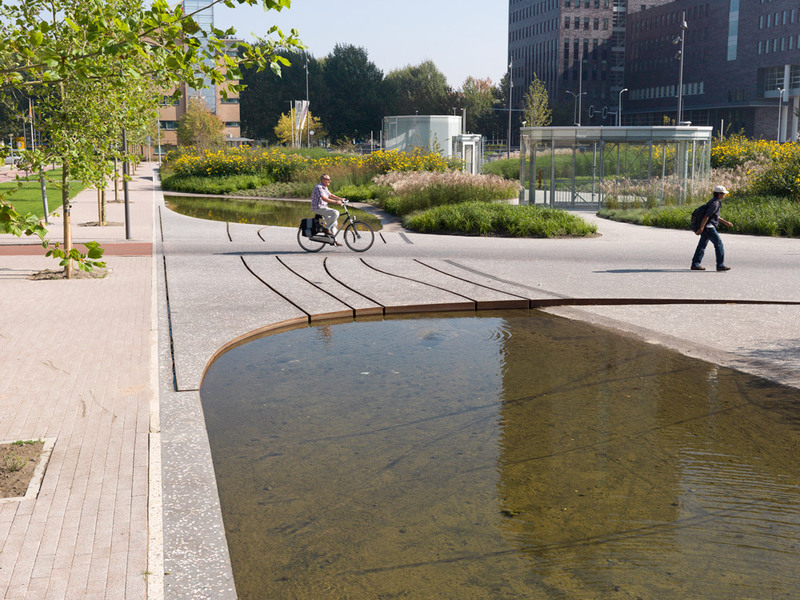 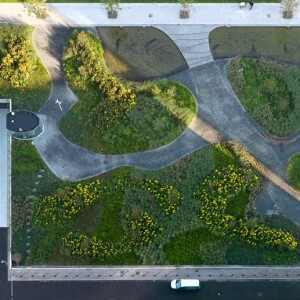 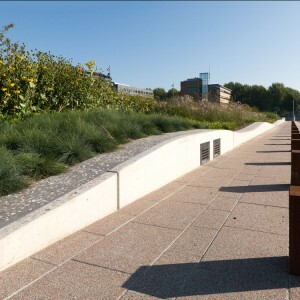 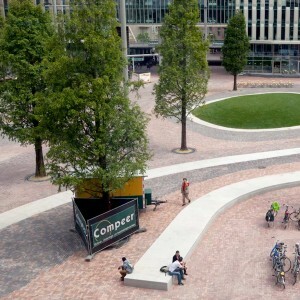 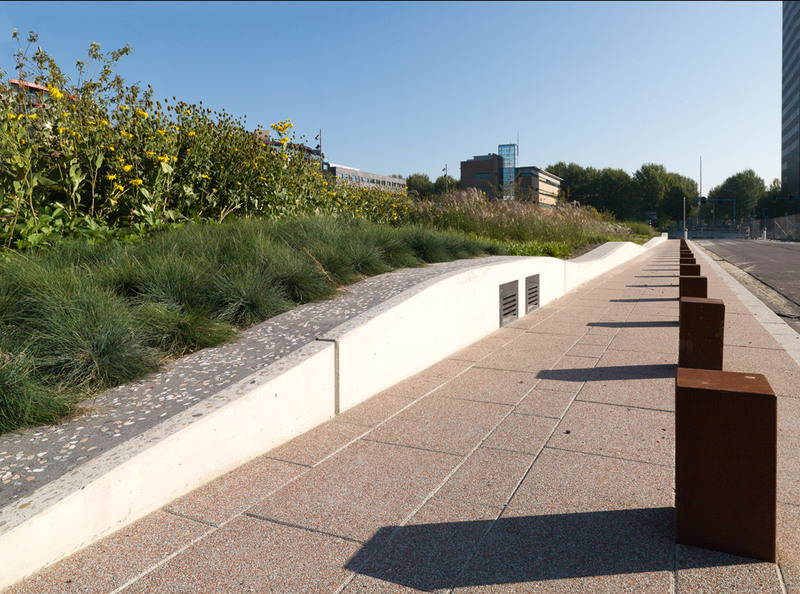 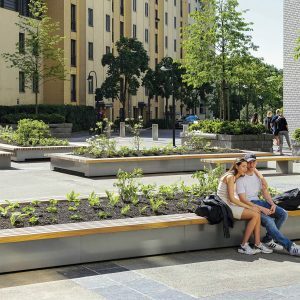 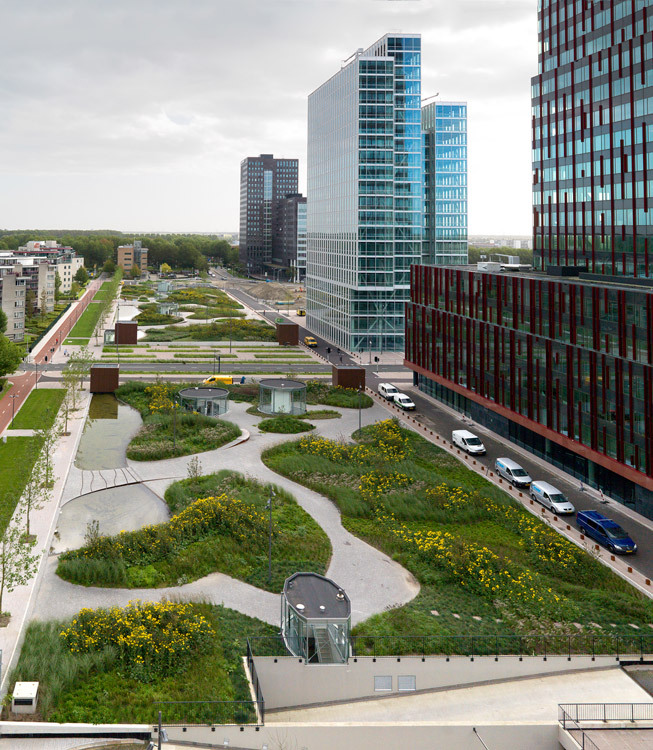 A park and a square designed by karres+brands have been completed in the new business district near Almere train station. 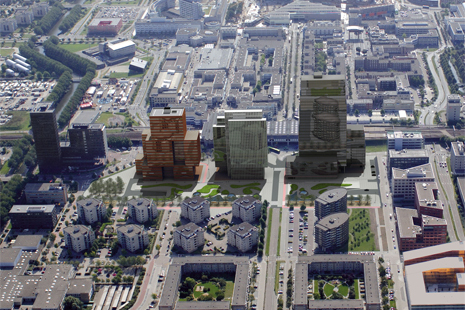 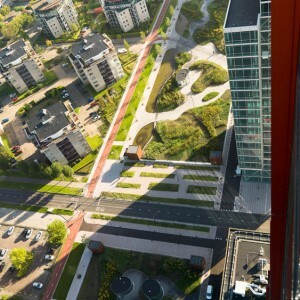 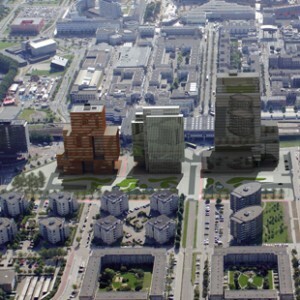 The new district includes three office towers developed by the investor Eurocommerce, which are the highest in Flevoland at a height of 120 meters. 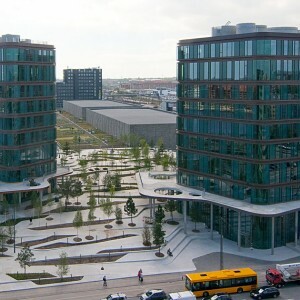 The park is situated above the underground car parking for the office towers, while the square mediates the area between the towers and the train station. 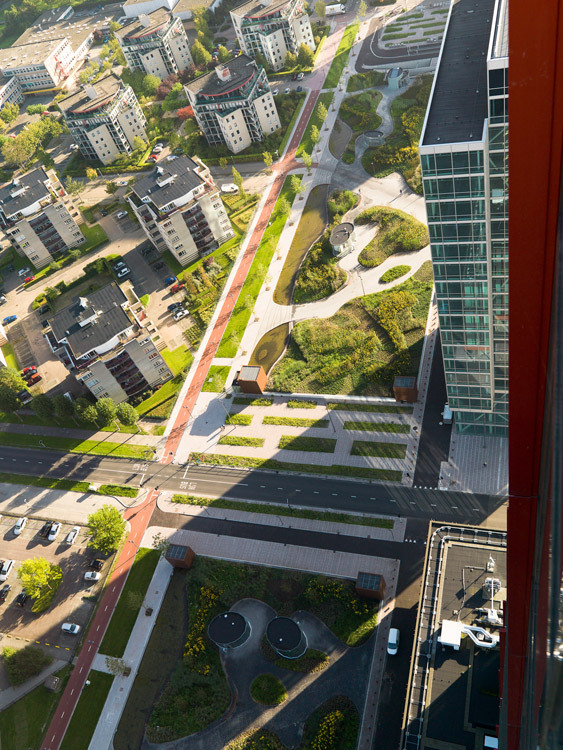 This area is part of a masterplan by Rem Koolhaas for Almere, an “Instant Skyline” defines the edge of the youngest city in the Netherlands. 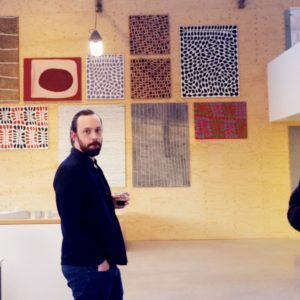 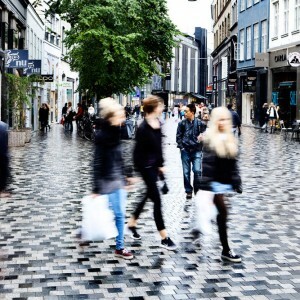 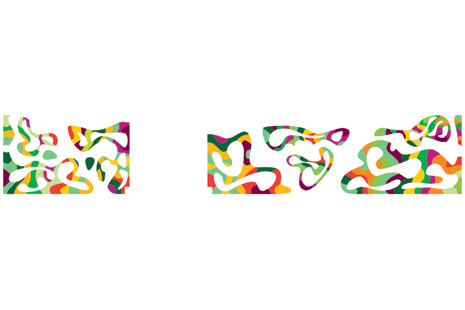 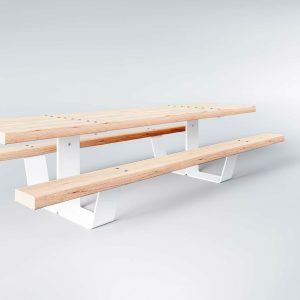 Karres and Brands adds an “Instant Identity” in this completely artificial context. 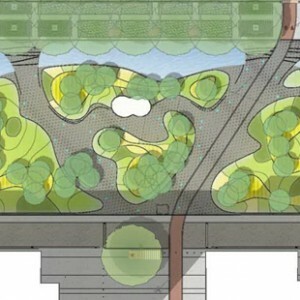 The park is situated on the roof of two four-layered underground parking garages. 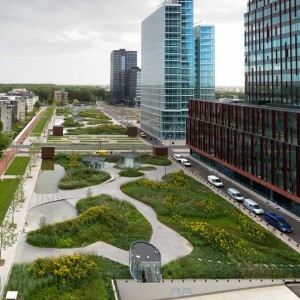 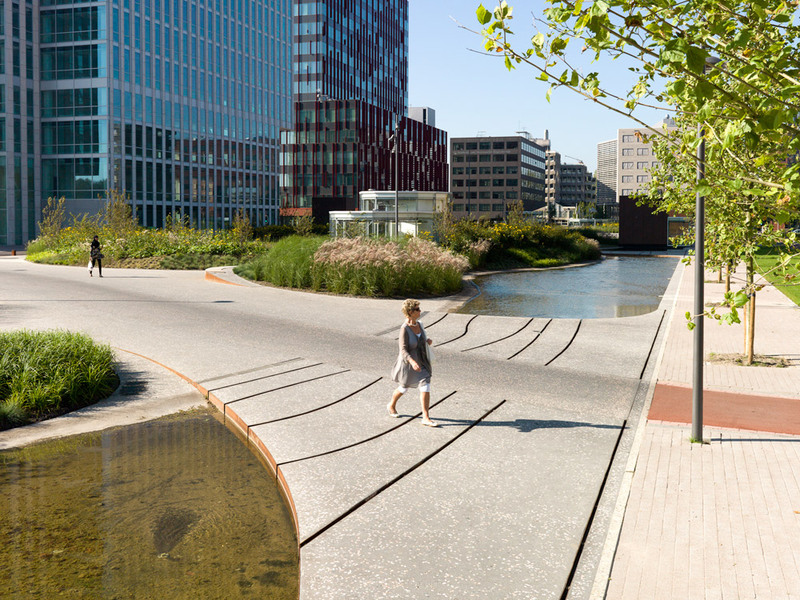 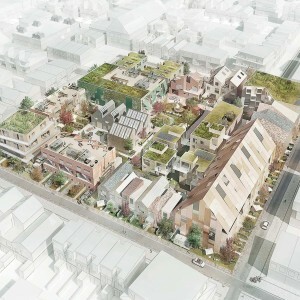 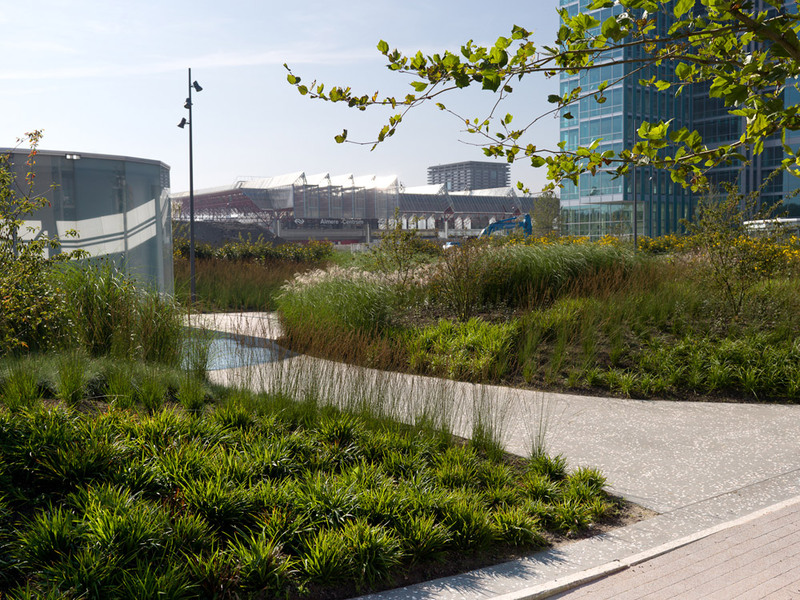 With its 200 meter length, it’s the largest rooftop park in the Netherlands. 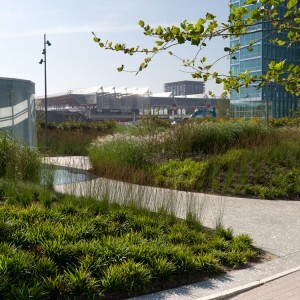 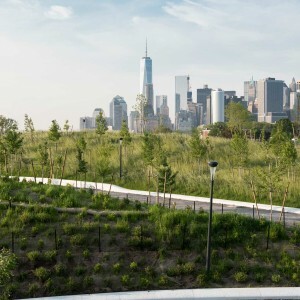 The park is a green oasis in a highly urban environment, a landscape with water features, grasses, perennials and flowering shrubs. 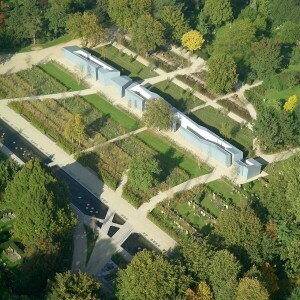 Seen from top of the towers, the park shows itself as a green patchwork that changes color throughout the seasons. 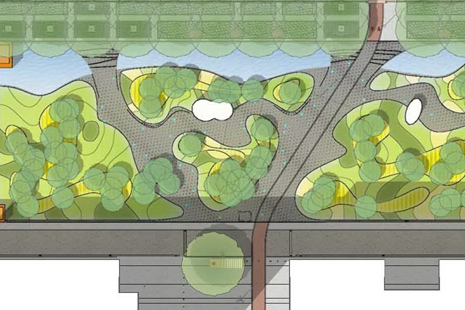 An avenue of mature plane trees defines a visual and spatial edge of the park. 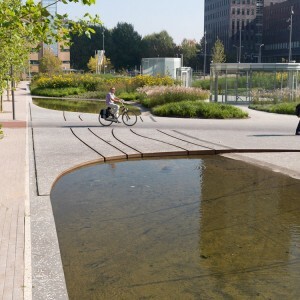 A 200 meter long pond runs along the northern edge of the park, drawing attention to the scale of the park. 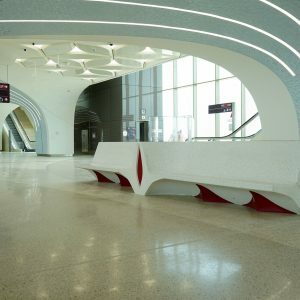 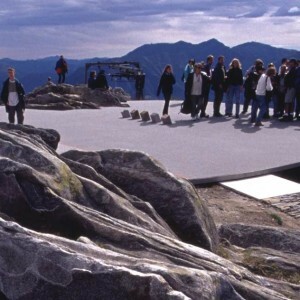 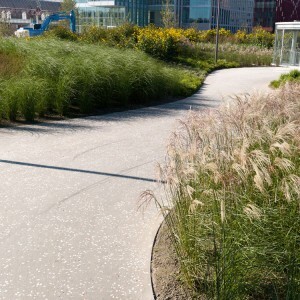 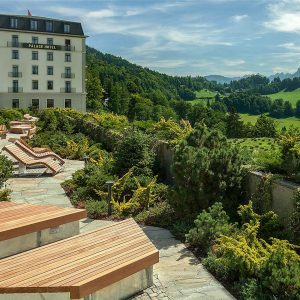 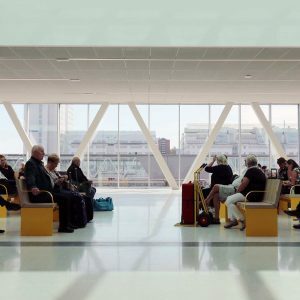 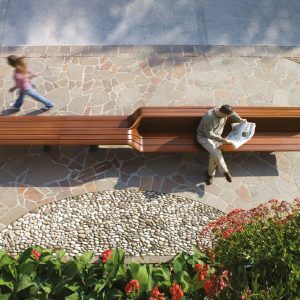 The paths are made of terrazzo asphalt, creating a continuous and seamless surface. 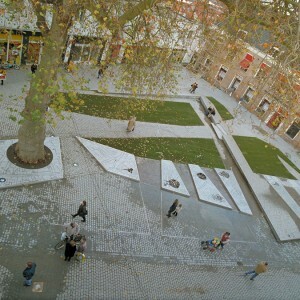 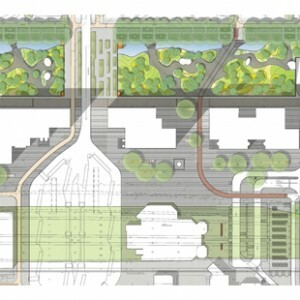 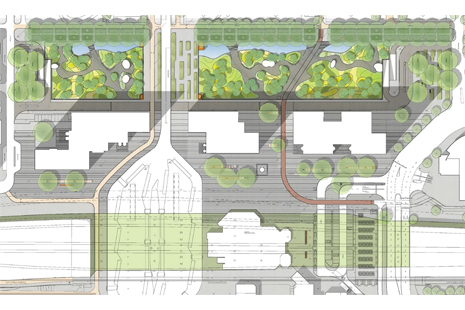 The square created between the park and station mediates between these two areas by the treatment of the pavement. 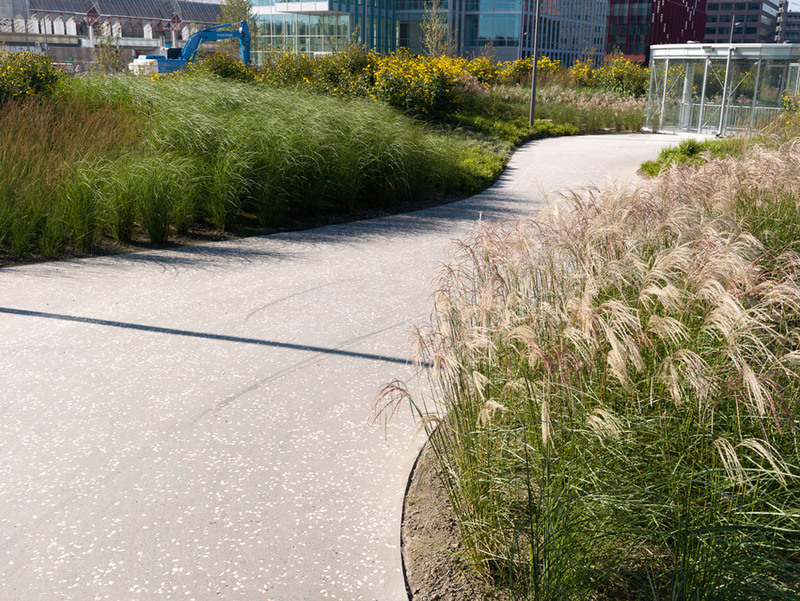 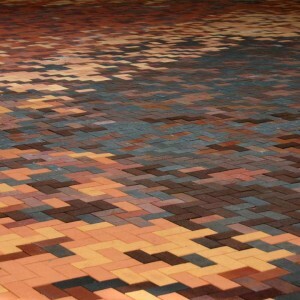 Several paving materials are combined in a bar code pattern, bringing together the natural stone of the station and city center and the terrazzo asphalt in the park. 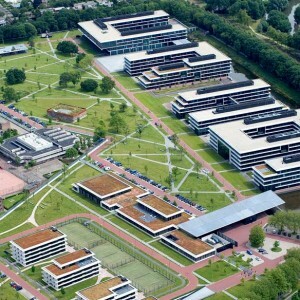 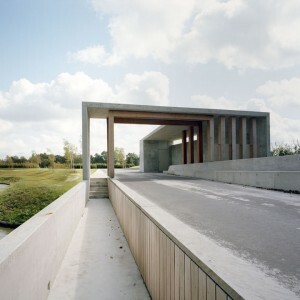 Architecture: Dam and Partners, ZZDP, Cie Architects. 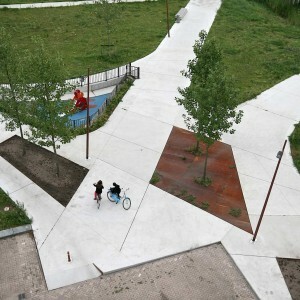 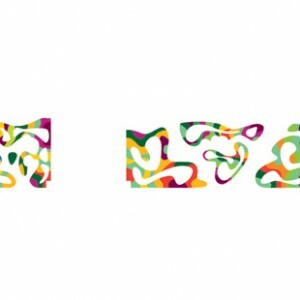 Could this be a Burle Marx copy, or ‘interpretation’?